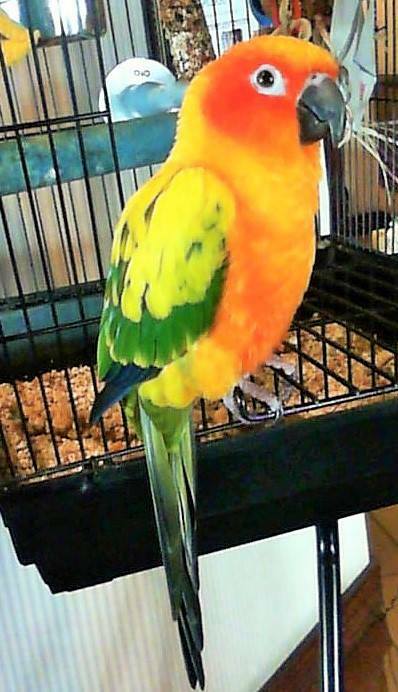 We decided that since we got such a fun reaction to our interview with “Aladdin the Christmas Camel” in the December issue we would feature our feathered friend “Emro the Sun Conure of the Boardwalk” in the May issue. I was lucky enough to tag along with Bob when he was doing the R&D for his Road Trip column for this month’s issue. The trek to Rehoboth, Delaware and the Boardwalk Plaza Hotel is always a fun one and that’s how I met Emro Jr.
We met the original Emro three years ago when we were staying at the Boardwalk conducting much of the same business of gathering information for a feature on Southern Delaware. Sadly, Emro Sr. passed away two years ago at the age of 24, however, happily, Emro Jr. was rescued shortly after. 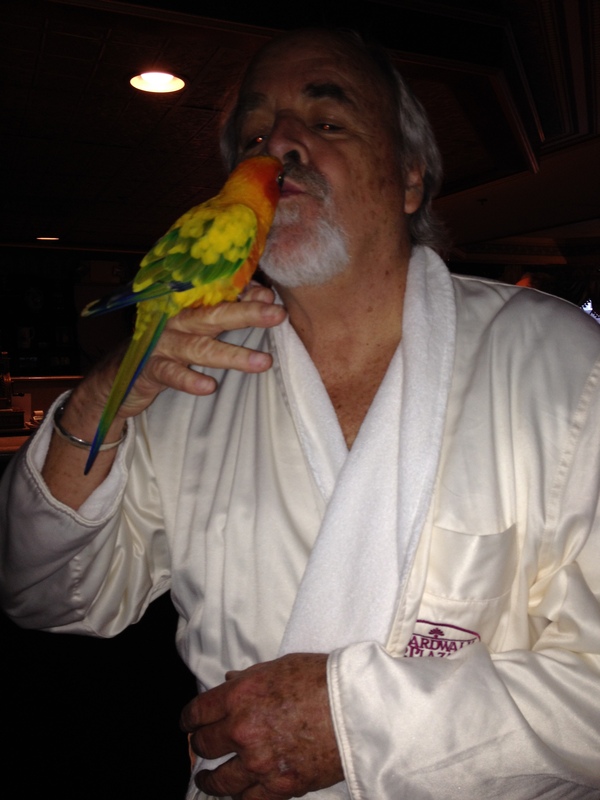 With a little help from the staff at the Boardwalk Hotel, I was able to garner some important information about my new BFFF (Best Feathered Friend Forever). Jennifer Zerby, Proprietor of the Boardwalk, told me that the original Emro belonged to her husband Jeff’s grandfather, Orme Meade. That is how Emro got his name – “Emro” is “Orme” spelled backwards! Very clever, don’t you think? I might have to think about that with the next pet I get that will need a name. Ummm, wait, maybe not so much…Inal?? Nope. “Emro Jr. is actually a hand-raised avian. He came from a local bird farm (M&D Bird Farm) where they hand-raise babies. Being hand-raised makes them more likely to be easily socialized once here at the Boardwalk Plaza,” said Zerby. She also informed me that, “Caged birds are quite Victorian, you know.” This also fits in with the theme of the hotel. All I can say is, I am so happy to say that I knew Emro Sr. and now am wild about Emro Jr. He is a crazy, spoiled little bird. I asked if she had any funny stories to tell me about him and she replied, “I don’t really have many stories, sorry…except what you experienced, which is that he is a spoiled little birdy who demands attention and will make a lot of noise to get it! It’s interesting how birds “choose” people they prefer. Emro (both of them!) loved(s) my husband, but me, not so much. I think it’s because he is in love with Jeff and sees me as the mate, the competition!” On a side note, I think Emro Sr. liked Bob better than he did me but I know Emro Jr. likes me best! (You can see a video of us on the OTC Facebook page). I would be really remiss if I didn’t mention Emro’s lobby mate, Peanut. 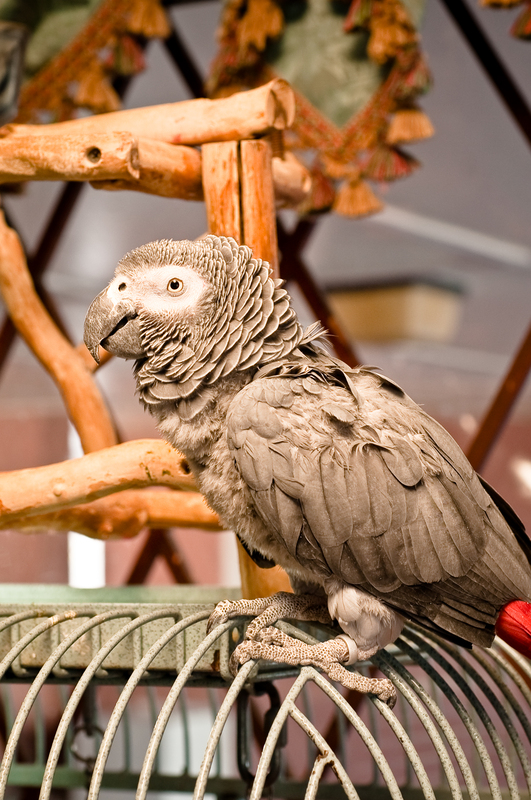 He is an African Grey parrot who is also a Jr. Both he and his predecessor were previously-owned rescue birds. We, regrettably, didn’t spend much time with him and that wasn’t a smart move. When I asked Jennifer for a little more information about him she told me that, “He talks a lot! He is apt to pick up what the front desk says on a regular basis. For example, ‘thank you for calling the Boardwalk Plaza Hotel’, ‘checking in?’, and has also been known to say things he picked up at his original home, such as, ‘Gentlemen, start your engines’. He is also quite the charmer, wolf-whistling at guests!” Now that I know that, I am definitely not waiting three more years to go back.